The option to hide the Node Library upon inserting a node, like the Keep Patch Library visible after inserting patch QC preference, see image. 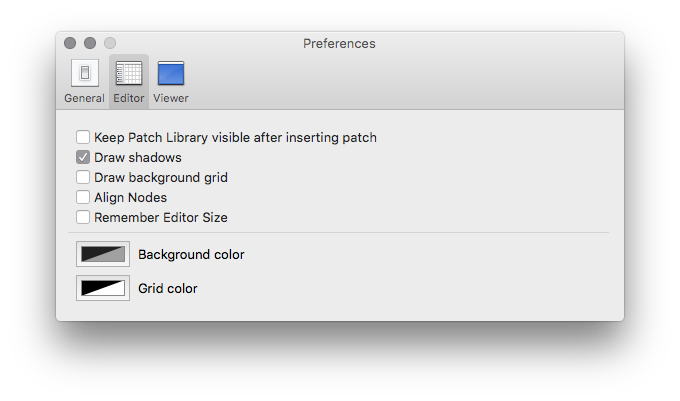 If the name changed to show/hide we could specify a shortcut manually in the System Preferences. whenever I'm working without an ext display I'm wishing both of these options (automatic and manual) existed. command return opens the library. while its open, command return again could just close it no? seanradio - An automatic close upon selecting a node would be (my) ideal. seanradio the problem with that Sean, is that cmd-return opens the node library AND highlights the search function. If the command to close would be the same, if you wanted to search/add several nodes, each time between each node the command would close the library and you'd have to hit the command again to search/add. a - like Philip said, an auto-hide as an option, probably better as a menu option with a shortcut that you can turn on/off. b - Another shortcut to hide the library, like Philip suggested too, either option-cmd-return or shift-cmd-return. So that you could use the (a) shortcut to keep the library on if you plan several nodes, use the cmd-return to each time to highlight the search bar and when you're done either auto-hide it with the (a) shortcut again, or close it with (b).